Transport yourself to the restorative and healing properties of the Fortifying Hair Mask formulated with naturally derived sources of Omega 3,6,9, fatty acids, antioxidants, vitamin A, D, E and minerals. This powerful professional strengthing hair mask, sourced completely from plant-derived COLLAGEN, deeply penetrates the hair shaft and fortifies each strand from roots to ends. Fortifying Hair Mask is an intensive treatment that targets 10 major signs of Dry and Brittle Hair — Dullness, Dryness, Brittle, Shedding, Lackluster, Split Ends, Texture, Volume, Frizz Control, Weak Hair – to help restore hair' texture and allover appearance. Deeply nourishes and moisturizes improves shine and softness, and protects hair from further damage. PLANT COLLAGEN A plant alternative to animal keratin through a unique ratio of amino acids. Collagen is often associated with elective cosmetic procedures to help reduce the appearance of lines and wrinkles. However, collagen is a naturally occurring protein found in the human body. It is essential for healthy skin, hair and nails. A collagen supplement can be especially effective in the growth and maintenance of healthy hair. Collagen do not improve the hair’s appearance, but it will work in the outside of the hair to surround the hair and protect it. INGREDIENTS: Water, Aloe Barbadensis Leaf Juice, Glycerin, Behentrimonium Methosulfate, Cetearyl Alcohol, Cetyl Alcohol, Behentrimonium Chloride, Cocos Nucifera (Coconut) Oil, Olea europaea (Olive) Fruit Oil, Adansonia Digitata (Baobab) Oil, Ricinus Communis (Castor) Seed Oil, Butyrospermum Parkii (Shea) Butter, Rosmarinus Officinalis (Rosemary) Oil, Lavandula Angustifolia (Lavender) Oil, Mentha Arvensis (Peppermint) Oil, Panthenol, Hydrolyzed Collagen, Cyclopentasiloxane, Amodimethicone, Preservative. Paraben Free. Capillary oil treatment enriched in a blend of 100% NATURAL OILS AND ESSENTIAL OIL for hair growth and strengthening of the hair strand. Strengthens, repairs, moisturizes, protects, conditions and deeply nourishes hair and scalp, leaving it soft, shiny, manageable and silky. It is absorbed quickly in the hair strand leaving a thin non-greasy layer and thus allow the product to act as a capillary serum. Water-free oil formula, infused with VEGETABLE COLLAGEN helps promote hair growth and restore hair fiber, for stronger, smoother and healthier hair. Ideal for anti-frizz. HEALTHY HAIR AND SCALP OIL TREATMENT - Innovative formula made with a blend of 100% natural carrier and essential oils, infused with PLANT COLLAGEN. 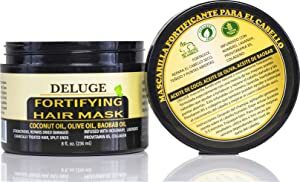 Natural and Organic deep hair treatment specially formulated with 100% natural ingredients that improve blood flow to the scalp, conditions hair, strengthens and restores the overall health and appearance of hair. Collagen is a naturally occurring protein found in the human body. It is essential for healthy skin, hair and nails. Your body produces its own collagen in abundance to make your skin, bones, hair, nails, muscles, and all your organs, but you wind up producing less and less as you get older. This is the cause of the signs of aging. With a lack of collagen, the hair becomes weakened and brittle and is easily broken. It also loses its shine and softness and may even fall. It is therefore important that collagen keep doing its role in giving hair the necessary nutrients to keep it alive, beautiful and healthy. 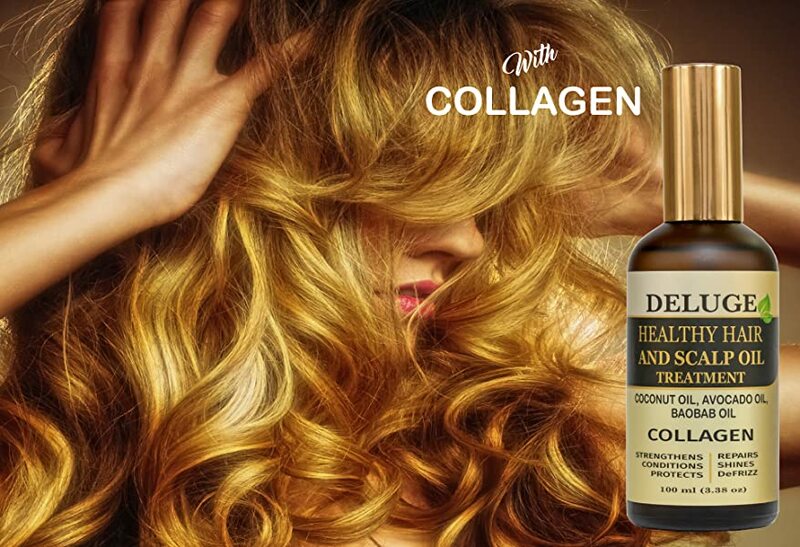 Collagen has been shown to be very effective in the treatment of dry brittle hair, repairing and reversing split ends as well as supporting healthy moisture levels within the hair. Keeping your hair healthy is the main benefit of collagen. Maybe used for both as a hair serum and hair oil treatment.